Is it really that fair to be slagging off Ed Sheeran? After some time out of the public eye, Ed Sheeran is back in the headlines this week. Not so much for his music or because of any juicy gossip. It's because he wore a t-shirt and jeans while performing 'Perfect Duet' with Beyoncé, who was dressed significantly more Beyoncily. 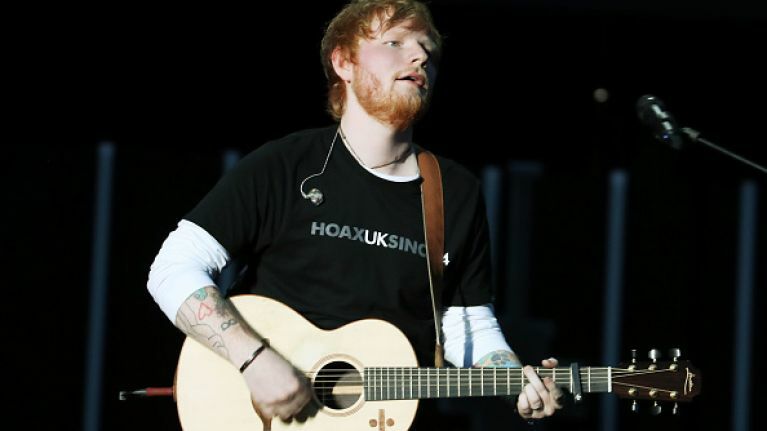 It's not the first time that Ed Sheeran has been roundly lambasted on social media. The first such instance was when he featured on an episode of Game of Thrones in a way that seemed so utterly, uncomfortably ham-fisted into the script that it's actually, genuinely shocking that the creators allowed it. This time, he's facing criticism for a real-world performance at a tribute concert for what would have been Nelson Mandela's 100th birthday. However, this most recent criticism of Sheeran doesn't amount to all that much more than: "He's an uncommonly ugly lad with terrible clothes." And I can say that with a clear conscience, because unfortunately for me, I've been cursed with looking like the guy, as I am reminded on every single night out. Sure, Ed Sheeran is popular in the general sense, but I can promise you nobody likes this dude for his looks. And that's really what was at the heart of the issue. Drake could perform next to Beyoncé wearing a a vest and jeans. Jay-Z could perform next to Beyoncé wearing a Brooklyn Nets jersey and trainers. She did a song with Sean Paul, for God's sake. Ed Sheeran can't pull the look off because he's not what you'd call conventionally attractive, and his clothes don't fit as well, and his choice of jeans are pretty terrible. But how okay is it for us to focus on these facts as legitimate grounds for anger? In this day and age, not very. Some painted the argument as emblematic of the different levels of effort men and women need to exhibit in order to succeed. Such inequality undoubtedly exists — at every level of every walk of life. Wage gaps and imbalances throughout every echelon of society will tell you that. But Ed Sheeran and Beyoncé are bad examples. Ed Sheeran isn't someone who's being rewarded for laziness. He's just poorly dressed, and a bit ugly. God love him. 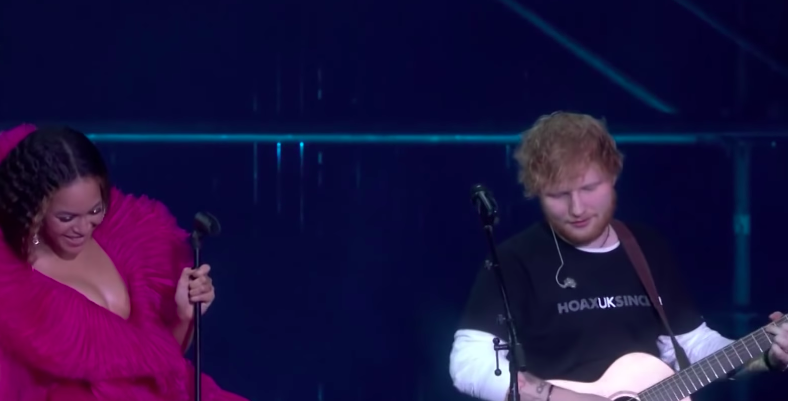 People speak about double standards, but a rather salient double standard at play could simply be that Ed Sheeran doesn't look like he should be famous. Chubby, and ginger, and pale and short. It can't really be about Ed Sheeran making it to the top the easy way. Say what you will about Ed Sheeran but the guy has put in his time as much as can be expected of any modern pop-star. He has been touring constantly since the age of 18, plays his own guitar and writes his own songs, and he writes songs for other major artists too... including the song that Beyoncé was singing with him. One could hypothesise that it looks that way because he's standing next to Beyoncé, probably the closest thing Planet Earth has to an Olympic god, so what else would you expect? 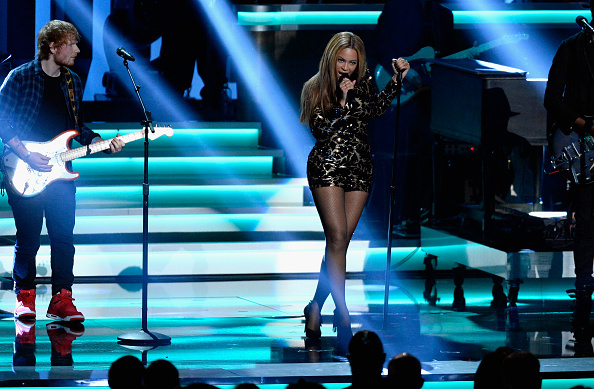 Are there some dorky guys with guitarists out there who would look cool standing next to Beyoncé? If we threw Glen Hansard or Chris Martin up there would they look any less thrown together compared Beyoncé? Maybe Sufjan Stevens, and he'd probably be wearing a tank-top. Attempts to moralise and rationalise the criticism of Sheeran for dressing however he wants are therefore incredibly weak. People should wear whatever they want — up to and including Beyoncé. However, I suspect that had Beyoncé emerged in a t-shirt and jeans then people would have been disappointed. Not Ed Sheeran fans, mind, but the Beyhive who have come to expect sheer perfection from the woman's every step. Absolute aesthetic symmetry in every swing of her ponytail. So good that you need to wear a suit and tie just to stand beside her. The slagging came in the same week that Pete Davidson made a statement about the negative attention he has received since the end of his engagement to Ariana Grande. Davidson finished his note by saying: "No matter how hard the internet or anyone tries to make me kill myself, I won't." It was a pretty worrisome insight into the worst possible effects of over-the-top fandom. It got bad enough that Grande herself stepped in and told her fans they had misunderstood the point of her music, advised them to be gentler online, told them that she didn't endorse any criticism of Davidson and to "please let whatever point you're trying to make go". Grande's interjection, firmly in line with her consistently upstanding character, was a much-needed rebuke in a society where people are meme-ified and mocked mercilessly on social media with little thought for consequence. The saddest thing is that the "discussion" about Sheeran arose from what were very likely a few throwaway comments on social media which began to snowball. It's highly unlikely that anybody intentionally proposed that Sheeran's sartorial choices were a microcosm for gender inequalities that are far better illustrated by ordinary day-to-day experiences. Double standards of the most pernicious kind exist in the music industry, and all facets of life. 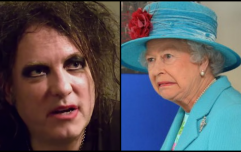 To make Ed Sheeran the face of that issue is not just unfair, but ridiculous.